The Illustrated London News. December 30th 1871. Page 637-638. On Saturday, May 28, 1853, the ILLUSTRATED LONDON News published a notice, with two illustrations, of the first public aquarium ever erected, which was on that day opened in the Zoological Society's Gardens, Regent's Park. In the present Number is given a representation of the largest public aquarium yet made, at the northern end of the Crystal Palace. The exhibition of the above-named aquarium in Regent's Park gave an enormous impulse to the popular study of living marine and fresh-water animate and plants; indeed, it may be said to have originated the movement which commenced in 1851, and which for a few years assumed so much the character of a "mania" that an aquarium in almost every house became quite an institution; and small ones, complete, with glass, water, plants, and animals, were, in 1855, hawked in the streets of London, and sold at a very small price. Soon afterwards another public aquarium was opened in Dublin, and two others in New York and Boston. In 1860. large one was set up in the recently-destroyed Acclieratation Gardens in Paris; and this was followed by one at Hamburg and one at Hanover, then by two there in Paris (in all there were three there in 1867), two at Havre, and by one each at Cologne, Brussels, Berlin, and Boulogne. till the money capital invested in these eleven French, Belgian, and German aquaria amounted to about £180,000. Although we regard the Regent's Park aquarium as having set a good example in the means of observing many animals which, previously to 1858, were known in life to but a few naturalists; and although, by its simplicity of construction and by its general arrangements (as then understood, however, erroneously), it stands in marked contrast with the pretentiousness of character of many of the French and German aquaria just named, yet it was soon discovered to be in many respects very defective. In particular, it was made at a period when it was the fashion to imitate the very successful iron and glass building of the Exhibition of 1851, and accordingly this Regent's Park aquarium was constructed like a conservatory or hothouse, set on a low wall of masonry. But, however well such an erection might be adapted for some forms of vegetation, and creatures needing much light and warmth, it was the very worst one possible for a collection of British aquatic plants and animals, the primary conditions of the existence of which are shade and coolness. Consequently, in the first summer of its existence, the mortality of the animals in the Regent's Park aquarium was very great, and the vegetation was stimulated into far too rapid a growth, which rendered the water turbid. The modifications which have since been made in the building, and which still exist there, have but partially remedied its original defects, among which have also to be enumerated the very serious ones of the small dimensions and tall and narrow proportions of the tanks (thus giving insufficient air-absorbing surfaces of water); and, chiefest of all, the very serious fault (in any but very diminutive tanks) of the, absence of adequate means of purification by keeping the water ever in motion; as in the sea, and in rivers, and even in ponds; this motion being needed in addition to the aeration effected by plants growing in the water. These considerations, added to the almost universal failure of domestic marine aquaria from the same causes, tended to impress the belief that success was impracticable or impossible; and hence England has so long remained without any important public aquarium, in spite of the wishes of scientific that one should be established. But the prosperous condition of one of the foreign aquaria - that at Hamburg - chiefly induced the formation of the Crystal Palace Aquarium Company, which commenced its operations in April, 1870, and the building now completed was begun in July, 1870. Some animals were introduced and exhibited in August, 1871; and the collection was added to till it was ready for its recent inauguration. It stands on a part of the ground left vacant by the fire of 1866, and consists of a building of one story high, measuring altogether about 400 ft. long and 70 ft. broad. The present arrangements are entirely marine, but space is provided for the addition of fresh-water tanks. There are 100,000 gallons of sea-water, of which 80,000 gallons are below the floor of the saloon, and 20,000 gallons in the tanks where the animals are shown. These tanks are sixty in number, and very in capacity from forty to 4000 gallons each. Thirty-eight of the tanks are far the public exhibition of creatures and their associated plants, and are contained in a saloon and two smaller rooms, but the remaining twenty-two tanks, for the storage of surplus animals, are in a gallery (behind the large show tanks), and are not shown to the public. All the public tanks are fitted with plate glass, varying in thickness from three eighths of an inch to one inch; and through these, and in some tanks also through the surface of the water, the contours are seen. The sea-water is being constantly pumped by steam power from the great reservoir below to the tanks above, day and night, at the rate of from 5000 to 10,000 gallons an hour; and, after it has travelled from tank to tank through the entire series, it disappears below, to be again pumped up; and thus the same seawater may be used incessantly, without change, for a time which is believed to be practically illimitable, if fresh water be occasionally added, to supply the loss by evaporation, and if there be also added the solid constituents absorbed by some animals, as the lime and other matters contained in the shells of lobsters, oysters, and others. To guard against the chance of the stoppage of the streams, all parts of the machinery in motion or liable to get out of order are in duplicate. Thus there are two steam-engines, two pumps, and two boilers; and, that there may be no corrosion by sea-water, and consequent injury to animals, all the pipes, strainers, stopcock and jets are of vulcanite and stoneware. The architect is Mr. C. H. Driver, of Victoria-street, Westminster. The building is very solidly constructed, to bear the great weight it sustains and no more light is admitted than is necessary to enable the animals to be seen clearly and to cause the very small growth of vegetation necessary for their health, This exclusion of unnecessary light enables the place to be maintained desirably cool for the creatures and for visitors in summer, while in winter it is kept warm by hot-water pipes, and thus the temperature at all seasons varies only from 60 deg. to 80 deg. Fahr. Indeed, in this aquarium every known improvement suggested since aquaria have existed has been adopted. It is capable of containing a large and varied collection of living marine animals, from very small ones to those of considerable size, and there may be watched under circumstances very advantageous to the naturalist and the ordinary sightseer. In particular the operation of feeding the creatures is going on by day continually, except on Sundays. The entire general arrangements have been planned by the superintendent Mr. W. A. Lloyd. 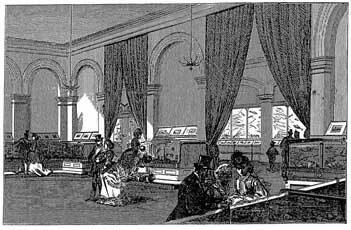 Our Illustration is a view of the saloon, seen from one of the smaller rooms.